Special. When the very last credit rose off screen, I decided this film was special. Special because it gave me emotion and it was a very specific emotion. There’s really only one way to describe it. I felt like a jackass; a jackass for spending Christmas money to watch the film, for convincing myself it may actually get better, and finally, for hoping that by the end I may actually utter a laugh. Did I mention this film is a comedy? Movie 43 is actually about 10 short films within a feature film. The film is anchored around Charlie, played by Dennis Quaid. Charlie is a deadbeat screenwriter who somehow manages to arrange a meeting with a fictional film studio, so that he can pitch his latest creations to Griffin (Greg Kinnear), a studio producer. Each pitch Charlie offers is more provocative, disrespectful, shameless, and dare I say more creative than the previous. Although Griffin wants no affiliation with Charlie’s horrid work, he soon discovers that he has no choice. This strange and interesting comedy stars a number of reputable actors and actresses, but none of their talents had a chance to succeed. Dennis Quaid, Hugh Jackman, Kate Winslet, Naomi Watts, and Halle Berry are all made to look like fools with characters that have no depth. The actors and actresses were merely familiar faces. And the faces shouted, “Look, I have no shame,” as they engage in some of the most outrageous and ridiculous filmmaking ever. Overall, you have probably guessed that I almost despised Movie 43, but I say this with a little bit of trepidation, because I thought I knew exactly what I was getting into. And for the most part I was right: it was going to be a ridiculous movie that would probably force me to cover my mouth in disgust more then force me on the floor laughing. What I didn’t expect is that it would be the most outlandish and offensive movie I have ever seen. But, and this is where my apprehension comes in, I was warned. The movie does not claim to be anything that it’s not. Even in the trailer below it will tell you that it is “Unexpected, Uncensored, and Unbelievable.” I can respect Movie 43 for wanting to be unexpected and ridiculous, and for sticking to its word. But that by no means makes it even a decent film. 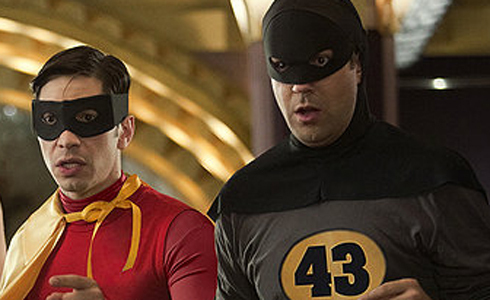 So, to all who read this, be forewarned…Movie 43 brings out the Jackass within you.